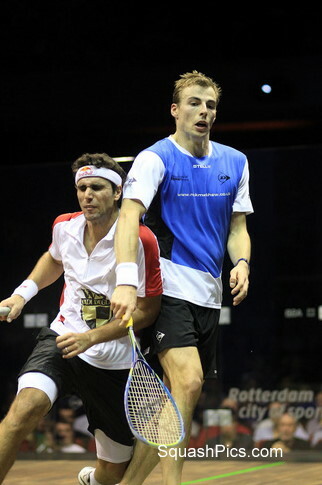 With all four semi-finals of the World Open Squash 2001 at the New Luxor Theatre in Rotterdam finishing in straight-game victories, defending champions and world number ones Nick Matthew and Nicol David remain on course to retain their title in this, the richest-ever squash event, with a combined prize fund of over $400,000. Their opponents in Sunday’s finals will be France’s Gregory Gaultier, twice a World Open runner-up, and Jenny Duncalf, the world number two who tonight reached her first World Open final. It’s surprising that Jenny Duncalf had never reached a World Open final, given that she’s been world number two for the best part of three years, surprising too that she’d never before met Samantha Teran, the surprise semi-finalist from Mexico. So the opening exchanges of the first World Open Squash 2011 semi-final at the Luxor Theatre in Rotterdam were understandably cagey. and there was little to separate the players for most of the first game before Duncalf played two immaculate rallies to take the lead 11/9. She was always ahead after that, despite the best and far from inconsiderable efforts of Teran. But the Englishwoman was determined to seize this opportunity too, and from 8/7 in the third an error was followed by two winners, followed by a muted celebration and a look of relief on Duncalf’s face. She know she has another job to do tomorrow. “It was maybe a bit tentative at the start but I felt more comfortable after I’d taken the first, that was massive,” admitted Duncalf. In that final she’ll meet Nicol David, the five-time champion who will be aiming to break Sarah Fitz-Gerald’s record tomorrow. 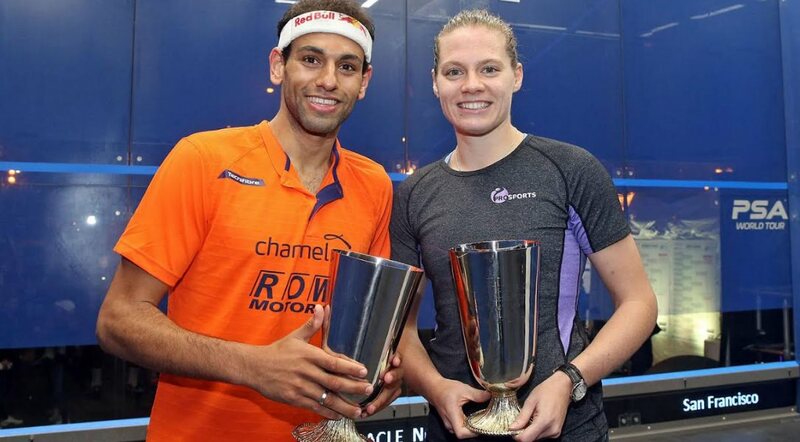 In comparison to the first semi-final’s first meeting of the two protagonists, Nicol’s opponent was all too familiar, she andNatalie Grinham had already contested two World Open finals and many many more major finals too. There were comparisons with the first match though – a tight first game, a comfortable second and a third where a comeback was threatened but not quite delivered. Even the scorelines were just one point apart, but the story was the same, and the winner was the same as in most of their meetings, Nicol David makes another World Open final. “It was a bit like deja vu all over again,” joked Nicol, “but playing Natalie again on her home turf, with a big crowd like this it was always going to be difficult, and winning that first game was crucial. “You can’t afford to think about it being a World Open semi-final, and breaking records or anything like that, you just have to treat it as another tournament, keep your focus and play each match as it comes. 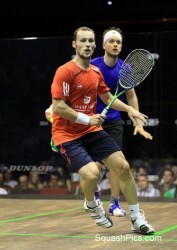 A second English finalist then, as Nick Matthew returned to the scene of his Saudi triumph last year. For two games it really could have gone either way, Karim Darwish matching the Englishman point for point, even if he was the one generally trailing by one, or at most two. The third was one way traffic. Darwish may not have been giving 100%, but Matthew made sure with a series of crisp winners at the start that left Darwish struggling to reach the ball, and once he was 5/0 up there was no way back. “I had a bit of luck at the end of each of the first two games, each time I took it on a glued to the wall shot,” said Matthew. The second men’s semi-final had echoes of the first, just as the ladies’ before them. James Willstrop and Gregory met in the final of the Qatar Classic scant days ago, and while that almost went to five before the Frenchman won, this one finished in three. Willstrop held his own until 4-all in the first, 4-3 in the second, and 4-2 in the third before Gaultier pulled away in all three to reach, coincidentally, his third World Open final. “The first game was pretty aggressive, but normally, James is not like that, and I’m not like that either, so we both relaxed in the second, and I think the quality of squash got better then,” said Gaultier. “James and I have been playing each other since we were kids, well I was that high, and he was THAT high! We had a very strong generation, James, Karim, Nick, and it’s nice to see that we are still competing today.